For the past few weeks I’ve been on a mission: To stock our freezer with as many delicious and healthy recipes as I possibly can. It’s become a bit of an obsession, really. I can’t be stopped. Since reaching 34 weeks, I’ve spent pretty much every spare minute cooking and freezing meals. I’ve chopped onions at 5 a.m. I’ve put recipes into the slow cooker at 10 p.m. I’ve been to Costco, Trader Joe’s, and Whole Foods more times than I can count. I’ve made so many lists that Robert’s sure he’s going to come home from work one day to find recipes scribbled on our walls. I’ve spent so many hours cooking on weekends that by the end of the day I can no longer stand. And you know what? I’ve loved every single moment of it! Honestly, deep down, I know that it may be a long time before I get to spend six consecutive hours on a Sunday by myself, cooking in the kitchen, blasting the Taylor Swift Pandora station. It’s my happy place. I know it’ll always be there for me, but I also know that it’ll look a little different for a while once Baby is here. So for now, I’m trying to soak up every moment and along the way create meals that hungry, sleep-deprived Future Paige and Future Robert will be oh so grateful to have. I’ve also kept careful notes (more lists!) of everything I’ve made along with instructions for prepping, freezing, and serving every recipe so I can share them with you! No matter your situation–baby on the way, crazy work schedule, busy home life–everyone can benefit from having a few (dozen?) 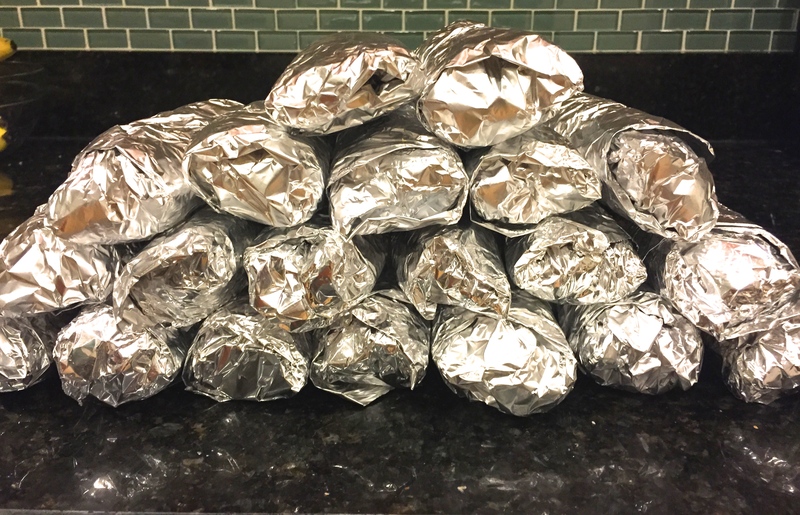 freezer meals ready to go. PART III: An update on how everything worked out, things that froze exceptionally well, changes I’d make for the future, etc. Freezing meals isn’t rocket science, but I’ve never done anything like this before so I’m sure there will be plenty to learn. Although I try to avoid plastic, stocking up on glass containers proved to be way too expensive for the volume of meals that I made. Once completely cooled, I froze most things in BPA-free 1 gallon sized freezer bags. Freeze plastic bags flat (place on a plate or baking sheet while freezing) so they take up less space in your freezer. LABEL LABEL LABEL EVERYTHING!!! What’s inside, date, etc. I’ll always prefer fresh food to frozen. So rather than cooking every single recipe all the way through (though some I did), in many instances I cooked it up to a certain point, froze it, and included instructions for how I’ll finish it once it’s thawed. All of these modifications are included in the instructions below. But if you want to cook a recipe all the way through and freeze it like that, by all means go for it! When the instructions below say “thaw in refrigerator overnight” it’s smart to place the bag in a baking dish or bowl in case any tiny holes occurred in the freezing process. Here’s the complete list of meals that I made for PART I. Scroll down to find cooking/freezing/thawing instructions for each recipe. In a bowl, combine raw chicken, coriander, cumin, salt, and yogurt. (Skip browning the chicken). Transfer to freezer bag. Make the sauce: Saute onion, garlic, 1 chopped, seeded jalapeno (instead of adding it whole), and salt until onions are soft & translucent (8-10 mins). Add garam masala and fresh ginger, cook about 1 minute, add tomatoes, increase heat and bring to a boil. Turn off heat and set aside to cool. When sauce is cool, pour into freezer bag with raw chicken. Freeze. Empty contents of bag into slow cooker. Follow remainder of the recipe. In a bowl, combine soy sauce through sriracha. Whisk together. Pour into bag with raw chicken. Freeze. Serve with brown rice, green vegetable (such as steamed spinach, broccoli, or bok choy), top with sesame seeds and chopped green onions. Place chicken breasts, raw, in freezer bag. In a bowl, whisk together the barbecue sauce, Italian dressing, and Worcestershire sauce (I omit the sugar). Pour into bag with raw chicken. Freeze. BBQ pulled chicken sandwiches: Pile chicken onto whole wheat buns with toppings. BBQ pulled chicken pizza: Top prepared pizza dough with extra BBQ sauce, BBQ pulled chicken, sliced red onion, and shredded mozzarella cheese. Bake. Top with chopped cilantro. Reheat soup in a pan on the stove or individual portions in the microwave. To make, freeze, and reheat: Follow recipe! This is totally extra credit, but SO easy especially if you use the slow cooker! Just dump the chicken carcass from the rotisserie chicken (and any remaining skin, etc.) into your slow cooker. Add any veggies from your veggie drawer: I usually add 3 to 4 carrots (unpeeled, quartered), 3 to 4 celery stalks (roughly chopped, it’s okay to keep any leaves on), fresh herbs such as parsley or green onions (if you have it—I’ve made it with and without), 1 yellow onion (unpeeled, quartered), 4 to 6 garlic cloves (unpeeled, smashed), 1 Tbsp or more black peppercorns, some Kosher salt, and then pour enough water to cover everything by about 1 to 2 inches. Cover and cook on LOW 12-24 hours. Pour contents of slow cooker through a strainer into a container (discard solids) and store broth in the refrigerator until chilled (overnight or even a whole day is fine). Skim the fat off of the top and either use the broth within a few days or pour into freezer bags or mason jars to freeze. Follow recipe (I substituted ground beef for the sausage), but skip pasta. Let cool. Transfer to freezer bag. Reheat soup on the stove. Taste and adjust any seasonings. Add cooked pasta. Add additional broth if needed. Reheat in a pot on the stove. Add extra sauce, if needed. You could also mix in some spinach or other greens until wilted. Follow recipe. Changes I made: Saute 1 jalapeno with the onion instead of using chipotle in adobo. Add 2 cups frozen corn when it’s done cooking (it’ll quickly thaw). Let cool. Transfer to freezer bag. Freeze. Reheat in a pot on stove. Add any toppings you like. Follow recipe through mixing ingredients in a large bowl. Instead of forming one giant meatloaf, divide into five smaller meatloaves (you’ll need 2 baking sheets). Spread as much ketchup as you like on each meatloaf. Bake about 60 minutes until internal temperature is 160 degrees. Allow meatloaves to cool completely. Individually wrap each meatloaf in parchment or wax paper, leaving a little space so the ketchup doesn’t get smushed. Then wrap in foil. Store in freezer bags. I like to serve meatloaves with mashed potatoes or sweet potatoes and something green such as sautéed broccolini. Follow recipe through browning the meatballs. Remove meatballs to baking sheet or baking dish to cool. 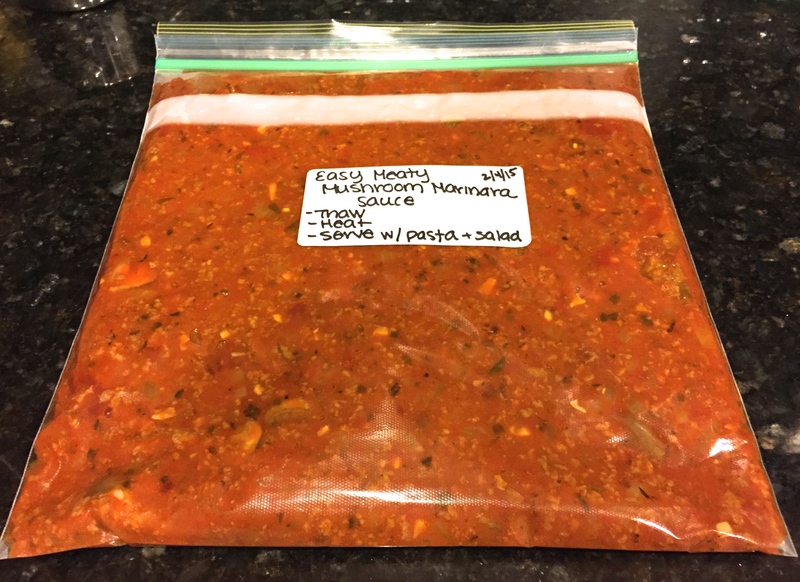 Pour pasta sauce into freezer bag. Add meatballs. Freeze. Preheat oven to 400 F. Finish following recipe: Empty contents of bag into a baking dish. Top meatballs with mozzarella. Bake, covered, for 30 minutes until bubbly. Uncover and broil until a light brown crust forms on the cheese, about 3 minutes. I used lean beef stew meat instead of bison. Follow recipe all the way through. Let cool. Transfer to freezer bag. Thaw in refrigerator overnight. Reheat in a pot on the stove. Add extra broth if needed. Thaw in refrigerator overnight. Reheat in a pot on stove. Add extra broth if needed. Follow recipe through adding beans. Let cool. Transfer to freezer bag(s). Cook penne. Add to soup. Follow recipe all the way through. Let cool. Transfer to freezer bag (I divided it between 2). Follow the recipe, except double the carrots per recipe (if you’re making one recipe use 2 carrots, if you’re doubling it use 4). Use low-sodium vegetable or chicken broth (not water). All soup to completely. Transfer to freezer bag(s). Thaw in refrigerator overnight. Reheat in a pot on stove or reheat individual portions in microwave. Taste and adjust seasonings as needed. Top with fresh lemon juice (so key!) and fresh chopped parsley. Serve with naan pizzas: Heat whole wheat naan (frozen) in the oven according to package instructions. Top with hummus, raw baby spinach or arugula, and anything else you like! 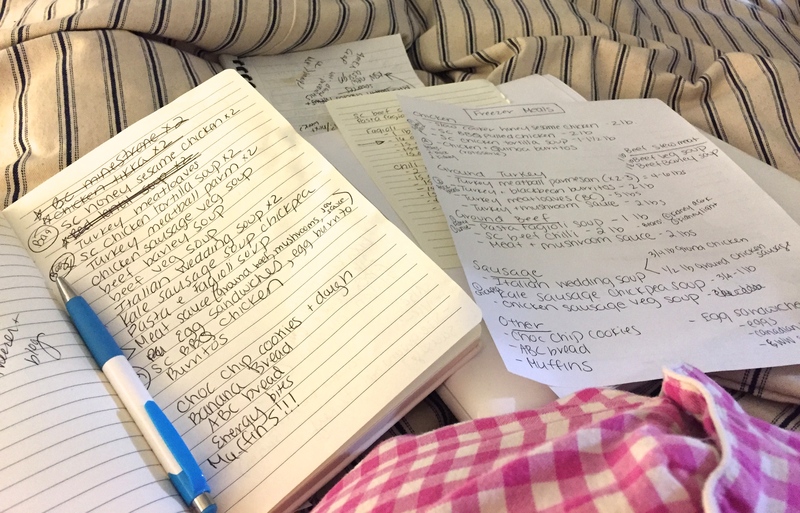 This entry was posted in Freezer Meals, Pregnancy & Baby on February 18, 2015 by Paige Greenfield.